In 1994, DC Comics decided to do away with Hal Jordan, who had been the primary Green Lantern of Earth since his first DC Comics appearance in 1959, and replace him with a new character to carry on the Green Lantern legacy, Kyle Rayner. The storyline, ”Emerald Twilight”, which began in Green Lantern (vol. 3) #48 (January 1994), involved Hal Jordan descending into madness following the complete destruction of his hometown, Coast City, by the villain Cyborg Superman and becoming the villain Parallax. Emerald Twilight, as scripted by Ron Marz, provoked severe outrage among many Green Lantern fans. 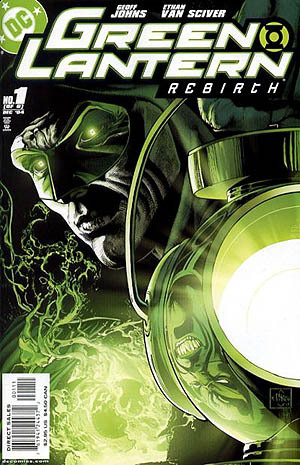 While retaining Kyle Rayner as the sole remaining Green Lantern, DC responded with more than one attempt to redeem Jordan’s image and hopefully win over the irate fans, first in the 1996 Final Night miniseries and crossover storyline, in which Jordan sacrificed his life in order to reignite Earth’s sun, and then in the 1999 Day of Judgment miniseries, in which his soul, languishing in purgatory, was chosen as the newest host for God’s “Spirit of Vengeance”, known as The Spectre. Hal Jordan is very popular with Green Lantern Fans. 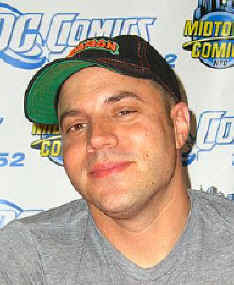 With dismal sales to Green Lantern titles and the cancellation of the Hal Jordan Spectre DC Comics assigned Geoff Johns as the writer to return Hal Jordan as a Green Lantern. Green Lantern: Rebirth, which would pave the way for Jordan’s return as a Green Lantern. The series would also answer lingering questions about Jordan’s character, as well as reveal the decades-long mystery of why the Green Lantern power rings, the powerful weapons assigned to each Lantern that allow them to conjure virtually any form of matter or energy, were unable to affect anything yellow in color. Geoff Johns wrote Green Lantern: Rebirth and it was a great success, people were reading Green Lantern again with Hal Jordan Back as the main character of the Green Lantern for the earth. The miniseries was a sales success also, with the first issue going through four printings, and selling a total of 156,975 copies. The second issue went through two printings and sold 122,221 copies. The subsequent issues sold 106,523, 108,077, 115,006, and 114,354 copies, respectively. 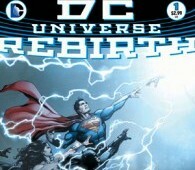 The final issue was ranked #8 in sales, and the #4 selling DC book for that month. Geoff Johns made Green Lantern popular again with great writing and innovative stories that were enjoyable to read making Green Lantern: Rebirth #1 one of the Greatest Comics of the 21st century. Geoff Johns (born 1973) is an American comic book writer, best known for his work for DC Comics, where he has been Chief Creative Officer since February 2010, in particular for characters such as Green Lantern, The Flash, and Superman. He is also a television writer, who has written episodes of Smallville, and a comic book retailer who co-owns Earth-2 Comics in Northridge, California with Carr D’Angelo and Jud Meyers. Johns shares a writing studio, The Empath Magic Tree House, with writers Jeph Loeb and Allan Heinberg. In Los Angeles, with no introduction Johns called the office of director Richard Donner, whose films Johns adored, in particular, The Goonies and the first two Superman films, which Johns felt captured the essence of that character, and were among the best films of all time. According to Johns, who called Donner’s office for an internship, he was transferred until Donner picked up the phone by accident, leading to a conversation, and the internship Johns sought. Johns started off copying scripts, and after about two months was hired as a runner, or production assistant for Donner, whom Johns regards as his mentor. Following initial online reports, The Hollywood Reporter has confirmed that Geoff Johns now holds the title of president and chief creative officer at the Warner Bros. division, answerable to Diane Nelson, who remains president of DC Entertainment, president of Warner Bros. Consumer Products and president and chief content officer of Warner Bros. In this position he can guide the DC Entertainment film direction in the future.